Butterfly Baby Screwback Stud Kid Earrings. The earrings are safely secured with comfortable screw back closure for a perfect fit. 14k White Gold. While we will continue to make every attempt to avoid such errors, they may still occur. Gemstone Butterfly Baby Screwback Stud Earrings. The earrings are safely secured with comfortable screw back closure for a perfect fit. 14k Yellow Gold. While we will continue to make every attempt to avoid such errors, they may still occur. 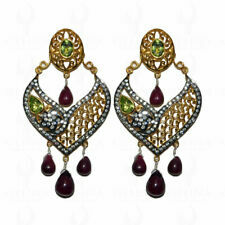 The earrings are safely secured with comfortable screw back closure for a perfect fit. Butterfly Baby Screwback Stud Kid Earrings. 14k Yellow Gold. While we will continue to make every attempt to avoid such errors, they may still occur. 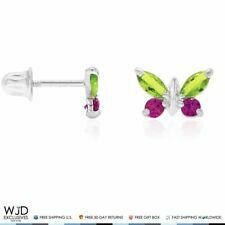 Gemstone Butterfly Baby Screwback Stud Earrings. These beautiful butterfly shaped stud earrings are sparkled with round cut peridot and marquise cut ruby gemstones that are carefully cradled in 14K solid yellow gold. 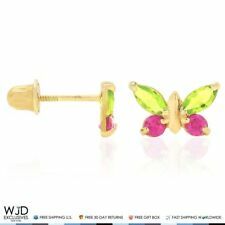 Gemstone Butterfly Baby Screwback Stud Kid Earrings. 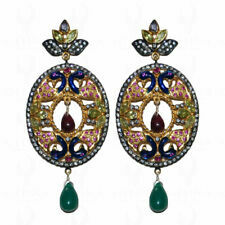 The earrings are safely secured with comfortable screw back closure for a perfect fit. 14k White Gold. While we will continue to make every attempt to avoid such errors, they may still occur. Composition:White Gold over 925 Sterling Silver. 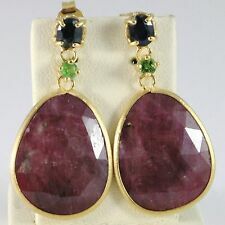 Item:Ladies Natural Fancy Gemstone Earrings. look like high quality Diamonds. All Gemstones are 100% Natural (no lab, simulant, composite, etc.). White Sapphires are eye clean, lively & beautiful.. 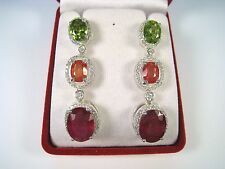 Item:Ladies Natural Ruby, Peridot & Orange/White Sapphire Earrings. Composition:White Gold over 925 Sterling Silver. All Gemstones are 100% Natural (no lab, simulant, composite, etc.). look like high quality Diamonds. LUSTER : GORGEOUS. FACE EARRINGS 16.0 MM. ORIGIN : MADAGASCAR, AUSTRALIA & PAKISTAN. WEIGHT (CT.) : 54.44 CT.(total weight of silver stone). TO 6.0 X 4.0MM FACE EARRINGS 32.0 X 11.0 MM. MAIN STONE COLOR : TOP RICH YELLOW. WEIGHT (CT.) : 21.34 CT.(total weight of silver stone). MAIN STONE SHAPE/CUT : PEAR CUT. 9K GOLD EARRINGS MADE IN ITALY. They have printed the mark of the gold fineness 375 (which is the Italian equivalent of 9k). 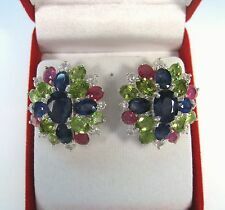 Stones: oval rubies, blue sapphires and green peridot. Supplied with box, warranty and invoice of our jewelry. F E E D B A C K. Total weight and size may vary slightly from item to item. A stunning pair of QVC genuine unusual 9ct yellow gold natural gemstone fancy cluster earrings. Large 8mm x 6mm pear cut Citrine, 2 marquise cut Peridot gems and 2 small round Ruby gems. Very pretty design. Sterling silver coated with 14k Rose Gold Rose Quartz Citrine Ruby & Peridot Earrings 35 x 25 mm citrine 9 x 9 mm rose quartz 10 x 9 mm peridot 4 x 3 mm ruby 4 x 3 mm.